Adorable Cayucos Cottage! Freshly Remodeled with Ocean Views! Three Bedroom, Two bath, with bonus sleeping space! Amazing Waterfront Condo with Fabulous Views! ADA compliant. Pet Friendly. From late June to mid Aug this home books from Friday to Friday. Holiday Season: reservations that block both Xmas and New Years may not be accepted, unless they are 10 days or longer. These policies may be relaxed within 30-60 days of arrival. Please contact us with any questions. PLEASE NOTE: This home will sleep a maximum of 8 people. We can offer the home to groups of 6 ADULTS and 2 CHILDREN. We do not allow sleeping on the floor, on blow up beds, or on the furniture etc. Your group must be able to sleep in the bedding provided. This adorable beach cottage is fresh off a full remodel! Relax in the beautifully manicured front yard BBQ’ing or chatting with family around the firepit. The tall fencing providing privacy and a wind block. Or move indoors where you can soak up the ocean views from the upstairs living space where kitchen, dining and living rooms all blend together. Each bedroom offers comfortable beds and tasteful decorations. The downstairs den offers additional sleeping arrangements, a second TV, board games and DVD’s galore. This home features something for every member of the family. Rest assured, this beach cottage will NOT disappoint. Living room and Dining area with open layout and ocean views! The third bedroom (upstairs, located off the living room) includes a queen size bed. The downstairs den includes a full-size futon for additional sleeping, TV, DVD player, lots of DVD’s and games! Private Outdoor Shower, with Hot Water! Perfect for rinsing off the sand when you get home from the beach. NO SMOKING AND NO PETS. This is strictly enforced. 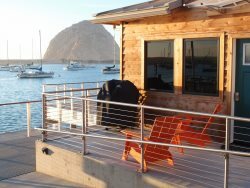 Cayucos by-the-Sea is located on California’s scenic Central Coast, halfway between Los Angeles and San Francisco. Cayucos sits quietly between the Pacific Ocean and the rolling hillsides of open ranchland and is what some people call "the last of the California beach towns." Listen to the quiet and stillness that only a small town in an untouched countryside can provide. Cayucos is the perfect remedy for those who suffer from the ills and frustrations of life in the fast lane in our crowded cities. Peaceful, underdeveloped ranchlands with cattle grazing on undulating, oak-crested hills provide a respite for the city weary. Property Protection Plan provides coverage for accidental damage to the home in lieu of a security deposit.